I honestly have very few objections to the less invasive kinds of cosmetic procedures. When skilfully performed, and in moderation, treatments like Botox and various high-action lasers can turn back the clock a little, leaving a face looking fresh, not frozen. Dermal fillers however are a different story. I rarely see a face that’s pumped full of fillers that doesn’t give me the chills. Overly puffy and eerily waxy are not a good look on anyone, despite what many, many filler advocates may preach.That fine line between youthful plumpness and terrifying plasticity is too often crossed (I’m looking at you Lebanon). Temporary filler creams have been on the market for a while now, with understandably booming popularity. The instant smoothing effects are so popular that products like Nanoblur sell at a rate of one every ten seconds. But their effects are short lived and once you remove your makeup, that’s it. Back to original, wrinkly you. Fillerina has upped the short-term plumping game. It’s an at-home filler that aims to reduce wrinkle depth and plump out features in just 14 days- with results that Swiss makers, Labo, claim last for three months. 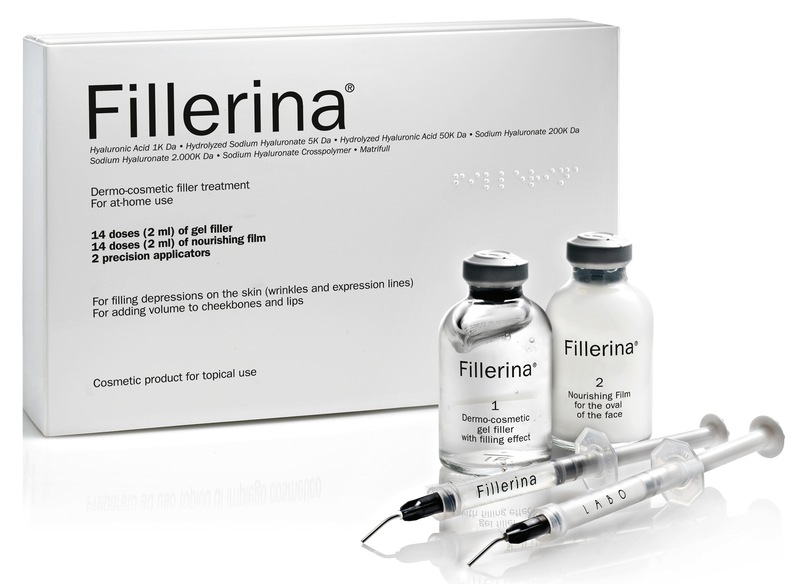 Rich in hyaluronic acid, a substance that’s naturally found in the body which helps keep skin looking plump, Fillerina is a two-step treatment with a “non-invasive needle”. It looks like a needle but it’s basically a cunning little precision applicator that measures out exact 2ml doses of product. It comes in three grades of strength depending on how obvious your wrinkles are. You start by applying the gel filler along the lines you want to fill. Leave it to soak in for ten minutes, then pat in any extra product. Next comes the nourishing film. This is to be massaged all over the face and neck for added hydration and plumpness. You repeat this ritual twice a day for fourteen days then maintain the results using the day and night creams. I used the product on the frown lines on my forehead as well as on my lips. I was amazed to see that the filling effect on my lips was immediate. Not dramatic enough for people to think I’d had them done, but I could see significant fullness on my top lip. The frown lines took a few days to become less apparent (damn you concentration face) but were definitely less evident by day 14. I found the day and night creams to be a little too rich for my combination skin, but a drier complexion would definitely benefit from their intensely hydrating formula. While the results don’t exactly last for three months (this is variable depending on your skin), it’s definitely worth it if you want radiant, subtly plumper-looking skin, in a “I’ve just had the best night’s sleep of my life and drank four litres of mineral water” kind of way. Have you tried any instant filler products? How did it go?